← When was the last time you donated blood? Cardiopulmonary resuscitation (CPR) is a series of life-saving actions that improve the chance of survival following cardiac arrest. Although the optimal approach to CPR may wary, depending on the rescuer, the victim, and the available resources, the fundamental challenge remains: how to achieve early and effective CPR. Given this challenge, recognition of arrest and prompt action by the rescuer continue to be priorities for the 2010 AHA Guidelines for CPR and ECC. Cardiac arrest occurs both in and out of the hospital and is still the leading cause of death in many parts of the world. According to Prof. Dr. Nadeem Hayat of Punjab Institute of Cardiology (in an informal seminar) that every day more than 1200 casualties occur in Pakistan of cardiac patients (declared patients and those without prior treatment). The grave concern is that attempted resuscitation is not always appropriate, there are many lives and life-years lost because appropriate resuscitation is not attempted. 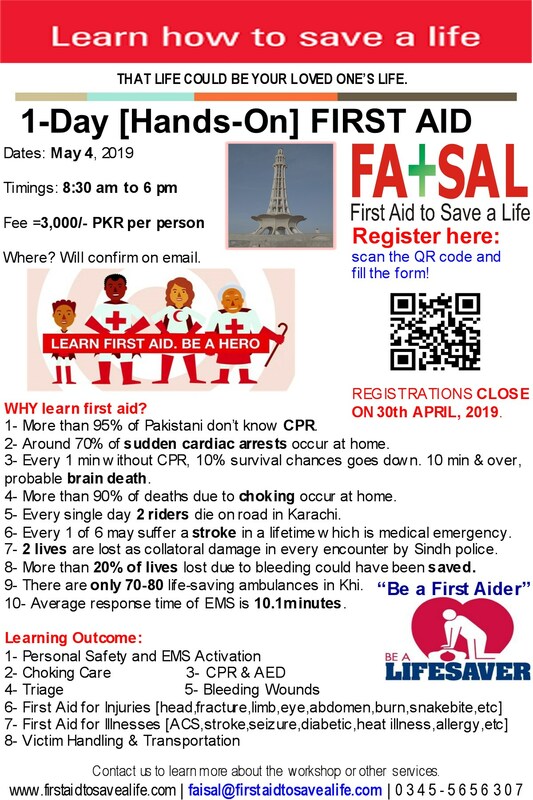 Unfortunately we can’t present cardiac arrest stats for Pakistan of in-hospital and out-of-hospital cases. But one thing is very sure that cardiac arrest continues to be an all-too-common cause of premature death, and small incremental improvements in survival can translate into thousands of lives saved every year. Key Principles in Resuscitation: Successful resuscitation following cardiac arrest required an integrated set of coordinated actions represented by the links in the Chain of Survival. Cardiac arrest is an important public health issue. Resuscitation involves a broad spectrum of individuals, stakeholders and groups. Key stakeholders include the public, emergency medical dispatchers, public safety organizations, EMS systems, hospitals, civic groups, and policy makers at the local, provincial and federal levels. Because the links in the Chain of Survival are interdependent, an effective resuscitation strategy required these individuals and groups to work in an integrated fashion and function as a system of care. Fundamental to a successful resuscitation system of care is the collective appreciation of the challenges and opportunities presented by the Chain of Survival. Hands-Only CPR is one of the key development to encourage layperson to attempt early CPR to save lives. With this (Hands-Only CPR) everyone can be a lifesaving rescuer for a cardiac arrest. All rescuers, regardless of training, should encourage laypersons to learn Hands-Only CPR to provide early chest compressions to all cardiac arrest victims. This entry was posted in Advanced First Aid, AEDs, CPR and AED, emergency care and first aid, First Aid and CPR, First Aid CPR and AED and tagged compressions only, Hands-Only CPR, Only-CPR. Bookmark the permalink.